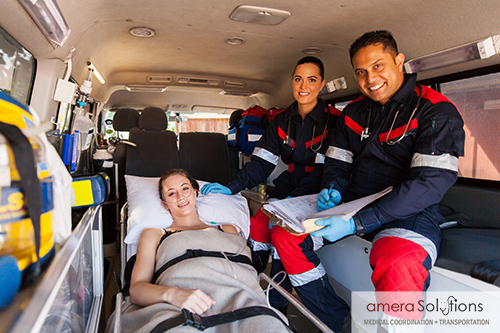 If you require non-emergency medical transportation for any reason, Amera is the private ambulance service that you can rely on for timely and efficient responses at affordable prices. Our agency has been coordinating private ambulances for well over a decade, and we have established our reputation as the premier private ambulance service agency. We have an extensive fleet of fully equipped vehicles ready to assist our global clients, so we can coordinate all medical transport scenarios. Plus, our private ambulance drivers are all thoroughly vetted, committed professionals, and licensed medics on our staff that can provide attention during the transportation process. We gladly accept all major credit cards, insurance that covers medical transportation costs, and private payments are welcome as well, but our services are not covered by Medicare or Medicaid. Effective, Affordable and Efficient Private Ambulance Services. When you are addressing some type of medical challenge, you have to stay focused on the healing process. Transportation issues can be stressful under these circumstances, and this is where Amera comes in. We have a great deal of experience working with people with disabilities, senior citizens, patients who are recovering from injuries and illnesses. 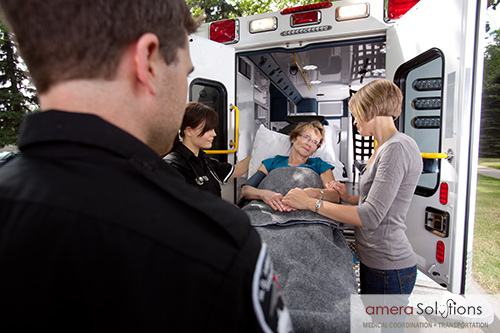 Whenever you need a private ambulance, Amera is just a phone call away.